Indico 15. Magnificent 1st floor 2 bedroom apartment. 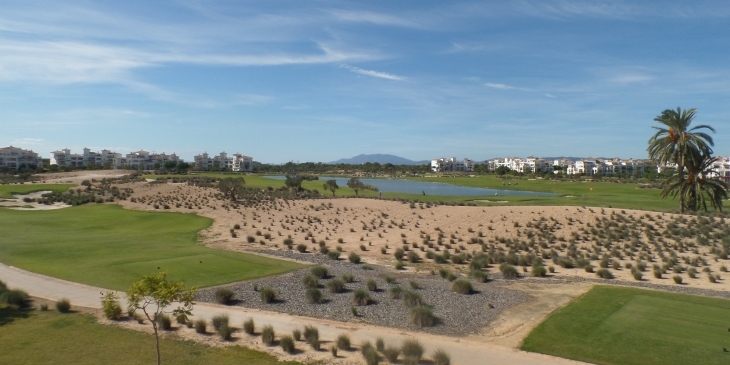 An ideal place for both golfers and families on the 18 hole Jack Nicklaus Championship Golf Course and only 1 minute walk from the pool. A perfect retreat for both winter and summer. OUR APARTMENT COMPRISES OF FULLY EQUIPPED KITCHEN WITH TABLE AND FOUR CHAIRS. LOUNGE LEADING ON TO THE BALCONY OVER LOOKING THE GOLF COURSE AND POOL. TWO BEDROOMS WITH FITTED WARDROBES AND LEADING ON TO BALCONY. Communal swimming pool just 1 minute from the apartment. Secure underground car parking. The region of Murcia has a fantastic micro climate offering over 300 days of sunshine per year, making this a great holiday location no matter what season season. The coastline has plenty of blue flag sandy beaches and is ideal for children, many of the beaches are within a 15 minute drive from the resort. The resort is close to both Cartagena and Murcia. The local airport of Murcia is just 15 minutes drive, and about 60 minutes drive from Alicante. There is a fantastic water park for all to enjoy.